To find out more about Norfolk County Golf Union click on the logo. On behalf of the Norfolk County Golf Union squad I would like to thank everyone at Desert Springs following our first warm weather training camp. We found Desert Springs to be a perfect venue as the practise facilities are first class and the Indiana Course is a great test which quickly lets the players and coach see any weaknesses. One the great things about staying on site was that there were few distractions and we found that the combination of this and the great facilities meant the players were fully focused on their golf. The Crocodile club and the Club House looked after us very well throughout our stay and our accommodation was perfect and gave the players a bit of space if they wanted it. will return with a larger group. 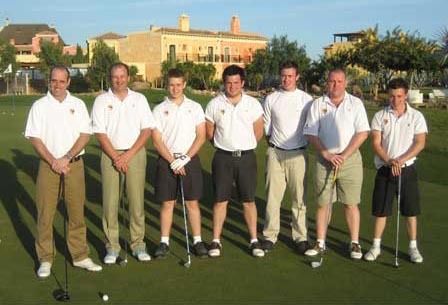 Norfolk County Golf Union selected The Desert Springs Resort and Golf Club, the international award winning family leisure resort located in Almeria, South East Spain, to host its first ever warm weather winter training Camp from the 22nd to the 26th of January 2008 for its first team squad. Desert Springs which is located in the Almanzora Valley, Almeria, south-east Spain, is the Official Spanish Home of the Women’s Elite Squads of the Golf Union of Wales and of the Ladies Golf Union, and is well versed in hosting golf’s elite players. “On behalf of the Norfolk County Golf Union squad, I would like to thank everyone at Desert Springs following our first warm weather training camp. We found Desert Springs to be the perfect venue. The practice facilities are first class and the Indiana Course is a great test which quickly lets the players and coach see any weaknesses. Desert Springs Resort and Golf Club is the only luxury family and desert golf resort in Europe and is located in the region with the warmest, driest and sunniest winter climate on the whole of the Iberian coast and in Europe without exception. It recently won the Bentley International Homes Awards for Best Spanish Development and for Best International Architecture and the Daily Mail Award for Best Almeria Development. In 2006, it was awarded the Spanish National Madera Verde Environmental Award and in 2007, The Trade Leaders Club presented its New Millennium Gastronomy Award for the Tourism, Hotel and Catering Industry to El Torrente, the resort’s leading restaurant. Most recently Desert Springs received the New Homes Gold Award for Best Overseas Garden and Landscape.